I made a coordinating card with the same paper and some SU! cardstock (Always Artichoke and Riding Hood Red). I embossed the red panel with my Cuttlebug and Textile Textures folder. For the monogram, I used my new JustRite Monogram Stamper and the Special Occasion Font. I cut and embossed the circles with my Circle Nestabilities. I also finished the inside of the card and added a strip of coordinating paper to the bottom. I'll be back tomorrow with the ATS Wednesday Challenge, and coming up on Friday is the first preview of the October C.C. Designs releases! I hope you'll stop back! As always, I really appreciate your visits -- have a fantastic day today! Sunday Supper: No Defrosting Needed! Place frozen chicken in crockpot. Mix together soup, mushrooms, salt and pepper and pour over chicken. Cover. Cook on Low 10-12 hours. Serve over rice. Happy Friday! Today I'm doing another "review preview" of a newly released C.C. Designs set -- this time, it's Sugarplum Halloween. 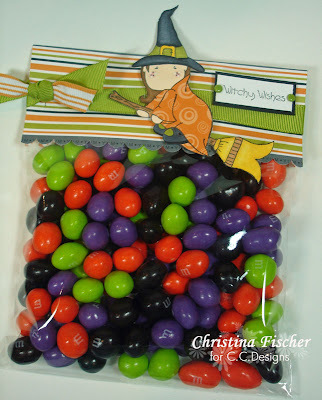 I used Witchy Olivia to make a treat bag. I love this project because it's EASY. Projects don't have to be complicated to be fun. The right combination of colors and images is all you need. I let the colors in the m&ms do most of the work for me! I simply made a topper with SU! Ghostly Greetings paper, scalloped the edges, stapled the sides, tied the ribbon around, and attached Olivia and the sentiment. It's time to go blog-hopping again! Head over to the ATS Blog to see which of my Design Teammates have a project with this set. One of them has a $5 gift certificate to All That Scraps to give away! Hi there! Tonight at All That Scraps there will be a new C.C. Designs set released called My Rubber Ducky. There is also a card kit available to go with the set. The kit has Cosmo Cricket Hello Sunshine paper in it. For my sample, I used SU! cardstock and American Crafts paper. The layout is this week's Sketch Challenge at SCS. I colored with Copics and sponged the edges of the white cardstock with Marigold Morning ink (retired SU! In Color). I added ribbon and Dew Drops as embellishments. Here's a closeup of the monkey. I put Crystal Lacquer on the floating bubbles, and I put Liquid Applique and Dazzling Diamonds glitter on the bubble foam. I finished the inside of the card with a sentiment and bubble images from the set. Wouldn't this be a fun way to give a spa certificate? If you want to see some more projects with this set, go to the ATS Blog, or check out the blogs of the rest of the ATS Design Team (on my sidebar). My Rubber Ducky will be released at 10:00 pm EST tonight, so be sure to stop by All That Scraps to get it! Happy Wednesday! 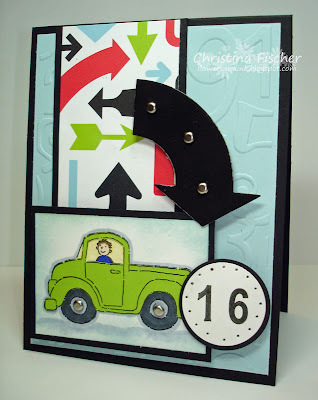 Today's ATS Wednesday Challenge is to make a pop-up card. There are lots of ways to make a pop-up card -- Jen has links to some of the SCS pop-up tutorials on the challenge post HERE. I used the C.C. Designs sets Spooky Spooky Spooky for the card front and Spooky Scene for the inside. 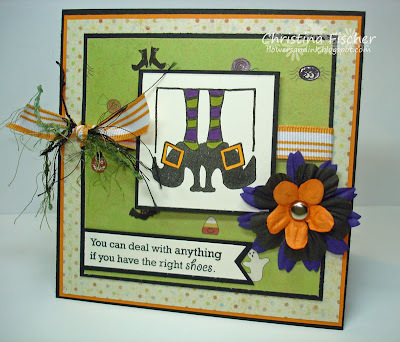 The inside sentiment is from Sugarplum Halloween. I used my Circle Nestabilities for the image and matting. I colored with Copics and sponged around the white circles with More Mustard ink. Here's the inside of the card. This is probably the easiest way to make a pop-up! Starting from the card fold, I cut two slits about 1" long. I opened the card and pushed the tab inward. I glued Baby Ghost below the fold, and he stands up when the card is opened! Play along with the challenge and try a pop-up card! You can find other samples on the ATS Blog and in the Wednesday Challenge section of the ATS Gallery. If you upload a card for the challenge, use keyword ATSDTC19. Hi, everyone! Have you seen the Heart to Heart Blog Candy on Carolyn King (Cammie)'s blog??? HOLY COW -- so many generous companies and individuals donated $1000 worth of prizes! Cammie's grandmother recently passed away after living with Alzheimer's, so she is doing amazing things to help the Alzheimer's Association and caregivers! 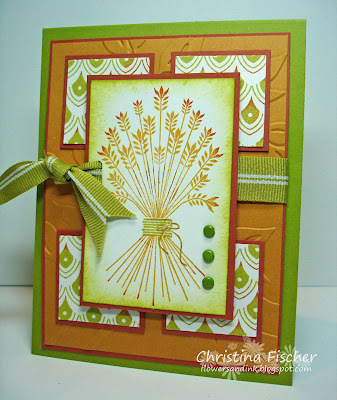 Gina K. Designs recently released Carolyn's set, Whimsical Autumn. Cammie is giving 100% of the proceeds to the Alzheimer's Association in memory of her grandmother. But she didn't stop there! Since Sunday, September 21, was World Alzheimer's Day, Cammie wanted to do something special for all the caregivers of Alzheimer's patients. In order to have a chance at her AMAZING blog candy, you have to make a card for a caregiver. Here's my card, made with Whimsical Autumn. The layout is Julee Tilman's Mojo Monday Sketch #54. The paper is from the Botanicabella Collection by Graphic 45 -- I picked it up at my LSS last week. 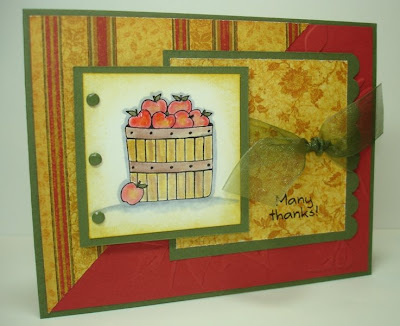 I embossed the red background panel with my Cuttlebug and Leafy Branch embossing folder. I colored the image with a blender pen and SU! inks, then I outlined the image and added a shadow with my Cool Gray Copic marker. I sponged the edges of the image panel with More Mustard ink. My husband's grandmother had Alzheimer's, and I have friends who have watched their parents suffer with it. It's a cruel disease, and it affects so many people. If you haven't already visited Cammie's Blog, please do it! She is truly an amazing lady, and she is surrounded by some fantastic and generous friends! Help her help the Alzheimer's Association and the caregivers! Today is my oldest's birthday -- he's 16 years old! I can't believe it! 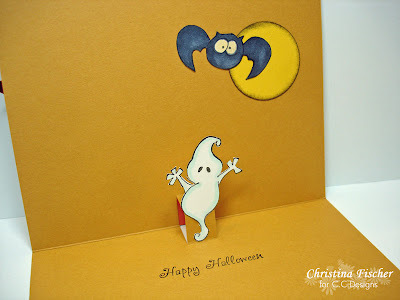 Here's the card I made for him, using Jen del Muro's Sketch for You to Try. It's a fun sketch, perfect for the image and paper I wanted to use! The truck is from SU! 's Loads of Love, and the numbers are from Melanie Muenchinger's set Just So Sporty, by Gina K. Designs. The dp is from American Crafts. I paper pieced the truck with the solid green that is the reverse side of the arrow pattern. I colored the rest of the image with Copics and sponged around the panel with Soft Sky ink. I had bought a package of chipboard arrows when I bought the paper -- they work perfectly together! I covered the arrow with Basic Black ink, and I added a trio of brads. I also added brads to the truck tires. 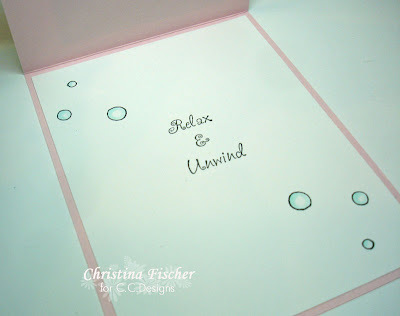 The Soft Sky background was Cuttlebugged with the Number Collage embossing folder. I pierced around the numbers and mounted everything on dimensional foam. Hello! It's time for another Sunday Supper recipe! Today's recipe comes from Donna Baker. 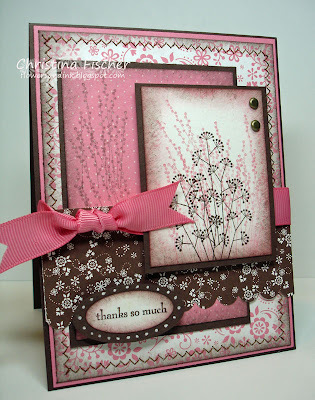 You can find her at her blog, Serenity in Stamping. She's incredibly talented, and she's so very kind, too! Please stop and pay her a visit, okay? Here is our absolute FAVORITE for the Fall/Winter season! We eat it with Jif cornbread - Yum! The recipe can be made on the stove but I prefer to just throw it in the crockpot! In a large saucepan, brown the sausage - drain fat. Add the remaining ingredients. Bring to a boil, reduce heat and simmer for 30 minutes. Or if you prefer, after you brown the sausage, throw all the ingredients in the crock pot. Have a great Sunday, everyone! Enjoy some family time around the supper table! Happy Saturday, everyone! I have a fun card to share with you today. I made it for Sharon Johnson's Stamp Simply Challenge to stamp in the style of Jennifer Buck (JenniB04). Jennifer is one of the newest SCS Dirty Dozen, and she has a clean, cute and classy style! I got lost in her blog posts -- she is SO talented! I decided to CASE Jennifer's card from THIS post. 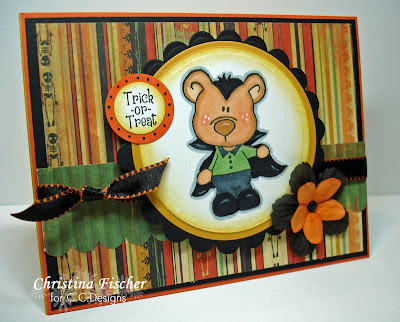 I created this Halloween card with a Michaels $1 stamp and a sentiment from Papertrey Ink. I'm a big fan of clean and cute cards -- I often stamp that way myself! The paper and images did most of the work here, and I just added some flowers, ribbon and fibers. I'm really happy with the way it turned out! Hello! Happy Friday to you! I have a little "Review Preview" of Spooky Spooky Spooky, one of the newly released sets by C.C. Designs. This image of Lucky just cracks me up! I colored Lucky and the bat with Copics, then I cut out the bat and mounted it on the corner. I sponged the edges of the image panel with Elegant Eggplant ink. 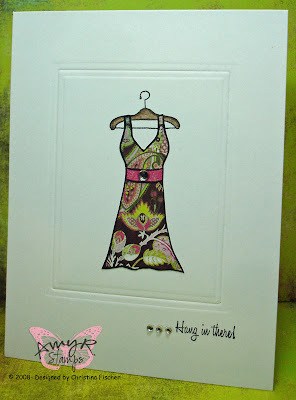 I used my Cuttlebug and D'vine Swirls embossing folder on the background paper. The glittery chipboard stars are from a halloween Glitterz pack by Junkitz -- I picked it up at my LSS a while back. Head over to the ATS Blog to see which of my Design Teammates have made other projects with this set. 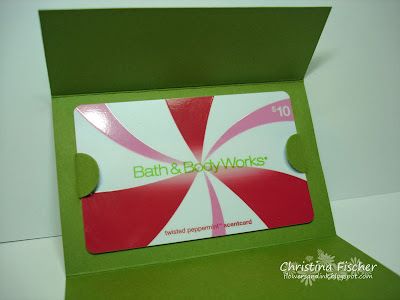 One of them has a $5 gift certificate to All That Scraps to give away, so do a little blog hopping to find it! Also, see THIS POST by Christine. Her daughter's teacher was recently diagnosed with breast cancer, so Christine is donating 5% of all orders placed today to the Chattanooga Susan G. Komen Race for a Cure. It's a great time to order those items on your wish list! I had planned to make and post a sample for this week's ATS Wednesday Challenge, but time got away from me! You can see DT samples on the ATS Blog HERE, or you can see all the challenge uploads at the ATS Gallery HERE. We'd love to have you play along at any time -- all the ATS Challenges can be found HERE. Hello! Happy Thursday! I'm still trying to play catch-up after being without power -- somehow the stamping took a back seat to laundry and dishes!! I do have something to share with you, though. Last week was an exciting one for me -- twice I received packages from Paper Crafts magazine, with my complimentary copies! I have a card in the October issue and I have a Christmas gift bag in Holiday Cards & More! We have electricity! Woohoo! It came back on around 4pm yesterday. There are still so many people without power -- please say a little prayer for all them! I have a new appreciation for the things I take for granted -- like flipping a light switch and being able to see! Since my stamping table is in the basement with no natural light, it was impossible to stamp anything during the day, and the night was definitely out of the question! Needless to say, I have a lot of catching up to do! Here is a card I didn't get to upload before the power went out. I made it for Jen del Muro's Sketch for You to Try. 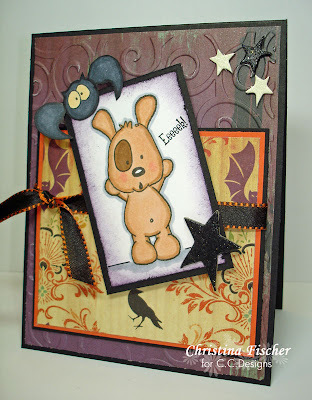 The challenge this week is to combine the sketch with a Stamping Bella image. I've been wanting to ink up Lattebella for quite a while, so this was the perfect reason! I colored with Copics and sponged the edges of the image and sentiment panels with River Rock ink. I tied natural hemp twine through SU! clear buttons for the trio of embellishments. The patterned paper is from the Archaic 6x6 pad by BasicGrey. Thanks so much for visiting today -- I always appreciate it when you stop by! Have a great day! Hi, everyone! I'm working tonight from Chris's office, because we have been without electricity at home since about 3:00 yesterday (Sunday) afternoon. We had terrible winds (gusts around 75 mph) all day -- compliments of Ike! Duke Energy said that 900,000 (about 90%) of their customers were without power, the most ever. It's down to about 600,000 at this point, and we're among them! It's a mess around our area -- lots of trees down, minor damage to some homes. Our rear gutter is in a mangled heap in our backyard! Luckily, though, no one was hurt, and I know that many others in our country have dealt with much worse. It certainly makes me count my blessings! Anyway, I'm here at Chris's office, getting laundry done and catching up on computer stuff, so I thought I'd sneak in a quick post. I made this card early yesterday before the storm hit. It's for the Featured Stamper Challenge at SCS. This week's FS is lazylizard. I CASEd her card shown HERE. I changed the colors and images, and I added some layers, ribbon, and a Cuttlebug background. The images are from First Fruits by Papertrey Ink. 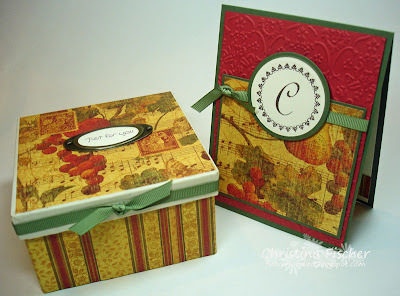 It is a gorgeous set, full of autumn and Thanksgiving images and sentiments. 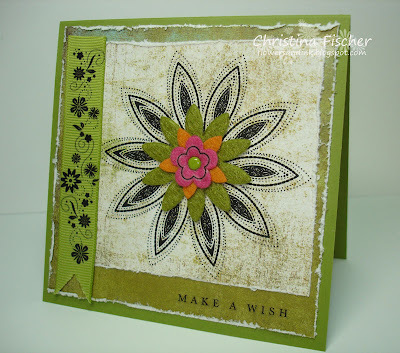 I created the "patterned paper" on the corners by stamping repeatedly with one of the images in the set. On the corners and the image panel I did a lot of rock-and-rolling. I really like how it turned out! Mix all soups together in crock-pot. Add stew meat and vegetables. Cook all day on high. Have a great Sunday, everyone -- enjoy some time around the supper table! Hi there! Happy Saturday to you! We have cross country and soccer today, plus Kyle's homecoming dance, so it's going to be a busy day! I have a quick and easy project to share with you. I created it because Megan needed a treat to give to her cross country "buddy" at today's meet. They exchange little gifts three times during the season. 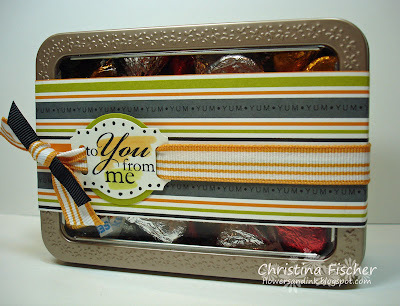 I repurposed this Prima container and filled it with chocolate kisses. 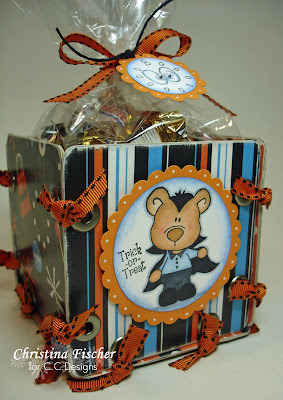 When I saw the "Yum" across this Ghostly Greetings paper, I thought it would be great for covering a treat container. I love this color combination, and I like that this particular pattern isn't strictly for Halloween. I had to cut two strips of the paper to completely go around the container. I stamped the sentiment from the level one hostess set Best Yet. 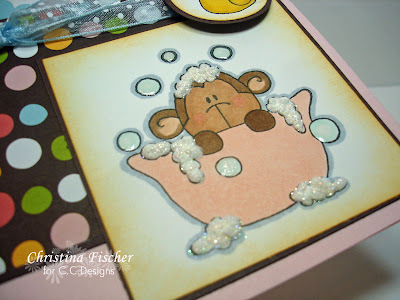 After stamping, I used an Aquapainter to highlight the words with Pumpkin Pie and Kiwi Kiss ink. I used the Designer Label punch to punch out the sentiment, then I backed it with a 1 3/8" circle. I added some dots with a black gel pen, then I used the Horizontal Slot punch to create a slider for the ribbon. That's it! Hi there! Happy Friday to you! 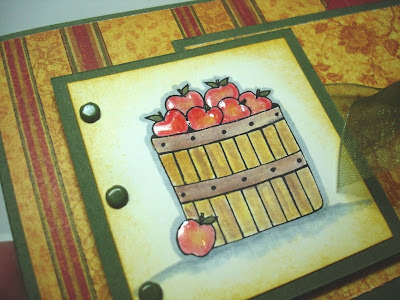 I made this card for Sharon Johnson's (aka notimetostamp) Stamp Simply Challenge to make a warm and cozy card in the style of Tammy Hershberger (aka stampertammy). I love Tammy's style, and it's a rainy, dreary day, so this challenge was a good one for me! I used my new SU! goodies, so that was a bonus, too! I think this Sweet Always paper has a homespun feel to it, especially when paired with Pocket Silhouettes. This is my all-time favorite color combination! I added a little sponging and machine stitching for some extra "coziness." When stamping on the patterned paper, I stamped off once -- I did the same for the rose background images on the main panel. I also did this week's Ways to Use It Challenge (using white gel pens) -- I drew white dots around the sentiment. Hello! Happy Wednesday! The ATS Challenge for today is to use Circle Inchies. "Inchies" are all over recently, so Jen's challenge to us was to use 1" circles instead of the usual 1" squares. It just so happens that many of the images in the new set by AmyR Stamps, Amy's Boutique, are perfect for inchies! 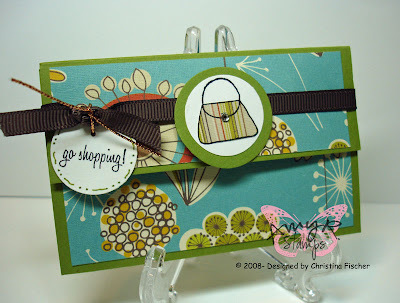 I went with the shopping theme and created a gift card holder. I saw this particular template last year on this post at Nancy Morgan's blog, Paper Smiles. I've used it many times since then! This is pretty self-explanatory, so I'll just point out a couple things. Both the sentiment and the purse were punched out with a 1" circle punch. The purse was paper pieced. The ribbon is tied all the way around the back of the card and across the top flap. The circle is attached to the ribbon with a glue dot; the whole thing simply slides off the top without being untied. If you'd like to play along, use keyword ATSDTC17 when uploading to a gallery. You can see other samples of challege projects in the ATS Challenge Gallery HERE. All the Wednesday Challenges are listed on this thread -- play along at any time! This is the last set I have to preview for tonight's release! 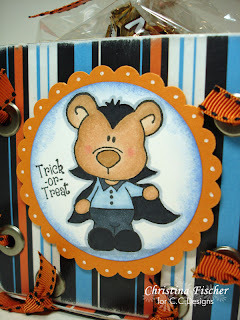 It's called Sugarplums Halloween, and it is SO darn cute! 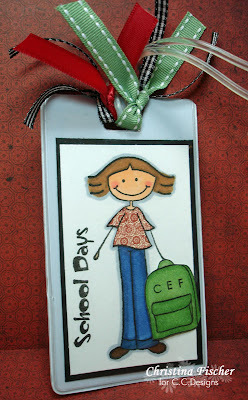 I hope you had a chance to visit the ATS Blog yesterday to see what my DT pals came up with!! There are so many great images in this set -- Christine really outdid herself on this one! 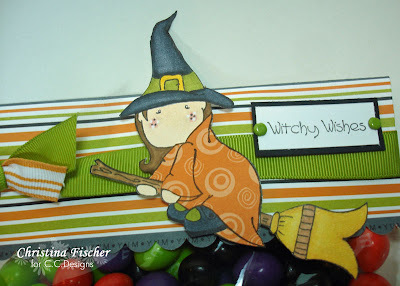 There's a witchy Olivia, a devilish Christopher, pumpkins, cat, bat, spider, and so many accessories and sentiments! 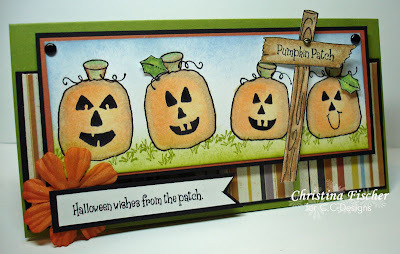 When I saw this sentiment, I immediately thought of making a card from my own little "pumpkin patch." So, here are my four kids, wishing everyone a Happy Halloween! :) The eyes, noses, mouths, vines, and leaves are all separate images -- you can "build-a-pumpkin" so easily! I just love the little sign, too -- there are quite a few phrases to put on it. This card measures 6.25" x 3.25". It will fit in a business size envelope. I did all my coloring with Prismacolor Pencils and Odorless Mineral Spirits (OMS). There are quite a few different OMS out there, but I use Turpenoid (purchased at Michaels). I added some grass from Sugarplums Scenery Set, and I sponged around the pumpkins with Bashful Blue and Old Olive ink. I cut out a couple leaves and popped them up on rolled up glue dots. I used a mini screw brad on the sign, and I also popped it up on rolled glue dots. I cut a fish tail in the sentiment panel for a little interest and backed it with a Prima flower. The image panel and sentiment panel are on dimensionals. Be sure to stop by the ATS Blog before noon EST today -- you can leave a comment on any of the preview posts for a chance to win the new sets! The Release Party is from 8-10 pm EST tonight on the ATS Message Board -- I hope to see you there! All the new sets will be available at 10:00 pm EST tonight! Happy Sunday! Before I get to the Sunday Supper recipe, I do have another C.C. Designs Preview for you! This set is called Spooky Scene -- there are great images for creating your own Halloween scene! I wanted to do something different with this one, so I created a picture frame. 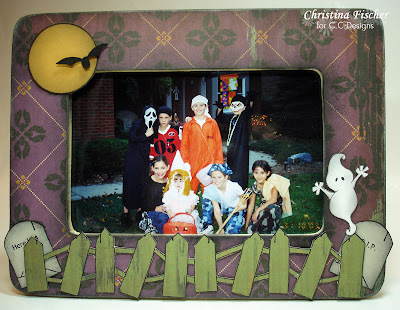 I covered a wooden frame from Michaels in this great Cosmo Cricket Haunted paper. I sanded the edges and sponged them with SU! Basic Black ink. The reverse side of the paper has a wood grain pattern in it, so I used it for the fence. The fence is stamped twice and cut out. The other images are stamped on card stock and cut out -- and I lightly sponged Basic Black ink around them for some dimension. For more samples of this set and the other releases, go to the ATS Blog, or check out the Design Team blogs (on my sidebar). All of the new sets will be available Tuesday, September 9 at All That Scraps. Lay chicken in single layer in shallow baking dish. Combine dressing and cranberry sauce, mixing well. Spoon sauce over chicken to cover, and bake, uncovered, at 350 degrees for 1 hour. Let set 5 minutes; serve over rice if desired. This dish also reheats well. To make the box, I covered both sides of chipboard coasters in different patterns of halloween paper, then I applied Mod Podge to all of them. I set Jumbo eyelets and tied ribbons through them to attach the sides together. 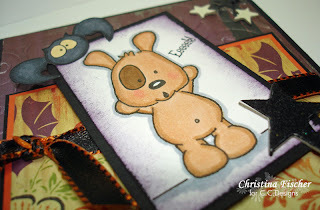 I stamped the bear and sentiment, and I colored with Copics. I used Marvy punches for the image circle and mat. I sponged the white circle with SU! Ballet Blue ink, and I added dots to the scallops with a white gel pen. For the tag, I used two images: the eyes and the Booooooooo circle. Christine designed the eyes to fit inside the circle perfectly, or you can use the images separately. I did the same sponging and white dots on the tag, and I adhered googly eyes over the eyes on the stamped image. I filled a cellophane bag with candy and placed it inside the box. I thought it also would be a cute centerpiece holding a small vase full of flowers! 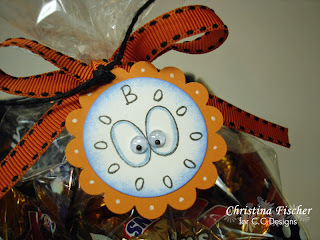 There are lots of gift possibilities for teachers, friends, or that "boo" treat for neighbors! A New Stamp Line from C.C. Designs! It's time to start previewing the September releases from C.C. Designs! Today's stamps are from a new line being manufactured by C.C. Designs, but they were designed and illustrated by our very own Amy Rysavy!!! They are called AmyR Stamps and will be available with the other C.C. Designs stamps at All That Scraps. Amy's first two sets are called Amy's Boutique and Boutique Sentiments. There are so many possibilities for the clothing images and sentiments in these sets! This is just one of the ideas I came up with -- I have many others swimming in my head already! I wanted to make a clean and simple (CAS) card, keeping the focus on the images. I stamped the hanger and colored it with Prismacolor Pencils and OMS. I paper pieced the dress and belt with BasicGrey Sultry paper. The embossed frame was made with Rectangle Nestabilities. The only embellishment was some rhinestones -- gotta have a little bling! Hey, everyone! I don't have anything to share today -- it's too hot to stamp! Our air conditioning has been out for two days. It wouldn't be bad except that the temperatures have been around 95 degrees those same two days! The temperatures inside the house reached 87 degrees at one point yesterday -- I was just too sticky and lifeless to do anything! We're getting a new AC/furnace today ($$$$), so hopefully I'll be able to stamp later without making a sweat puddle on the chair! The C.C. Designs previews start tomorrow, so I need to get in gear! :) Wait 'til you see the new stamps -- just so cute! If you like halloween, you're sure to love 'em! I decided to make a backpack tag for Caroline. She goes back to school (preschool) today -- the last of my four kids to start school! This is a pretty simple design. I stamped the image and sentiment from Donald and Daphne Go to School on white cardstock. I paper pieced Daphne's shirt with BasicGrey Boxer paper and colored the rest with Copics. The backpack was stamped, colored, cut out, and mounted on rolled up glue dots. I used Simple Alphabet by Papertrey Ink to put Caroline's initials on the backpack. I matted the image panel on black cardstock and tied ribbons to the top. That's it! Would you like to participate in the challenge? Use keyword ATSDTC16 when uploading to the ATS Gallery or other public gallery. All the Wednesday Challenges are posted HERE -- play along at any time! Happy Tuesday! Here is my card for today's Color Challenge at SCS. The challenge is monochromatic cards. I love the look of monochromatic cards -- they're just so pleasing to the eye. For my DT work I often use images that need coloring, so therefore I tend to use a lot of color -- it was nice to stamp a little more simply today. I stamped Linen on the card base in Old Olive classic ink. 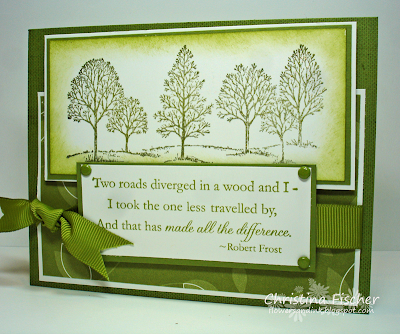 For the main image, I stamped the trees from Lovely as a Tree in Old Olive craft ink, then I heat embossed it with Iridescent Ice embossing powder. I wish you could see the shimmer -- it's pretty IRL! The sentiment is from Motivational Centers by Cornish Heritage Farms -- it's one of my favorite quotes. I sponged more Old Olive around the image panel, and I embellished with Old Olive brads and ribbon.